Congratulations to Robert, winner of this last weekend's Person-of-Mystery contest. He not only correctly identified George Washington Parke Custis, but he also gave additional information which directly related to the reason I picked him. Custis was the son of John Parke Custis, the son of Martha Washington by her first marriage and later the adopted son of George Washington. 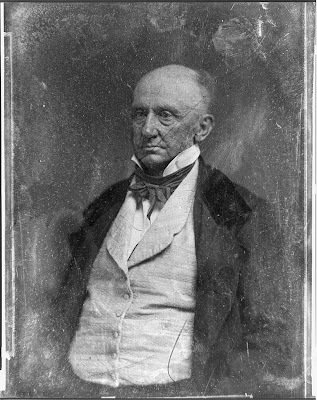 George Washington Parke Custis' father died at the Siege of Yorktown when he was only a few months old. After the Revolution, George Washington, adopted his grandson, so George Washington Parke Custis became the adopted son of his grandfather. Later in life, George Washington Parke Custis became by default the keeper of the largest collection of our first President's memorabilia and memory. He lived at Arlington House across the Potomac from Washington, DC. If you are not aware, his home is at the top of what is now Arlington Cemetery. 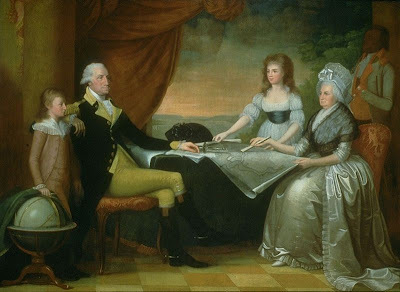 Visitors to Washington City, used to come by Arlington House to visit George Washington Parke Custis, see his father/grandfather's momentos and hear stories of Washington's life from a man who lived with the first president during his time in office. Only one of Custis' four children survived to adulthood, Mary Anna Randolph Custis, who married Robert E. Lee. 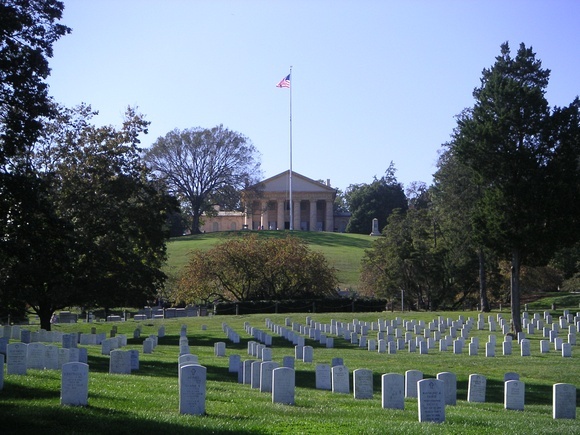 Upon Custis' death in 1857, Robert E. Lee, became executor of his father-in-law's estate and took possession of Arlington House. It was the Lee family home until the Civil War, when Federal authorities seized the home and started burying soldiers there to prevent the family from ever returning to a working home. By doing so, the Federal government unwittingly turned the highest point in the cemetery into a future shrine to Robert E. Lee. Lee for his part, was a big admirer of George Washington and absorbed many of the memories that his father-in-law related to him. 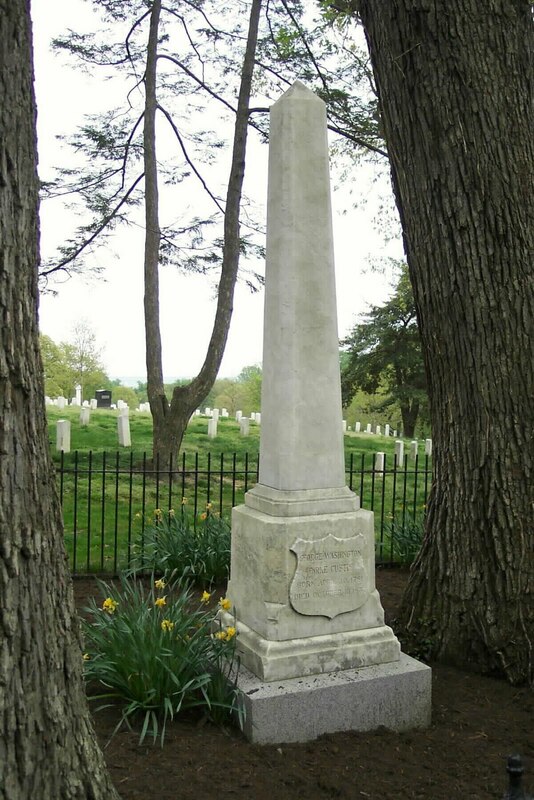 Lee's father, Harry "Lighthorse" Lee was himself a close personal friend of General Washington and was the man who famously eulogized him as "First in war, first in peace, first in the hearts of his countrymen." This connection is just one of the many reasons that the Civil War is so fascinating to me. George Washington Parke Custis is buried at what is now Arlington Cemetery at the old family plot. Another great lesson. Thanks, Nate. And now it's "Hi Ho Hi Ho. It's off to work YOU go..."
Great post! I knew about the R E Lee connection to the Arlington cemetary but not the Washington! Arlington is a must see if you ever visit DC. The Custis Lee mansion is fascinating to tour. It is dispiriting to learn about the history of the house (you can see the Capital area across the Potomac from the house), the people that lived there, and how the Union Army crushed any memories Lee and his family may have had there. They not only started a cemetary on the property, they dug a mass grave right outside the front door. It seems unnecessarily cruel. Lee's decision to go with Virginia must have stung very hard for this heartless behavior to happen.